There are several challenges when working with the Script Engine, including debugging and logging. One approach to overcome these challenges is to develop custom Java utilities that can be called from your scripts. These utilities can write to a custom log file or the Liferay log file. You can also place breakpoints in your utility code and step through it using your favorite debugger. Liferay’s use of Spring and PortletBeanLocatorUtil makes calling these Java utilities from your script easy, regardless of the scripting language you’re using. Let’s begin by creating a Liferay Hook project. If you’re using Liferay IDE or Liferay Developer Studio, select File → New → Liferay Project. Name the project script-utils and accept the display name generated by the wizard. Be sure to select Hook for the Plugin Type and then select Finish. 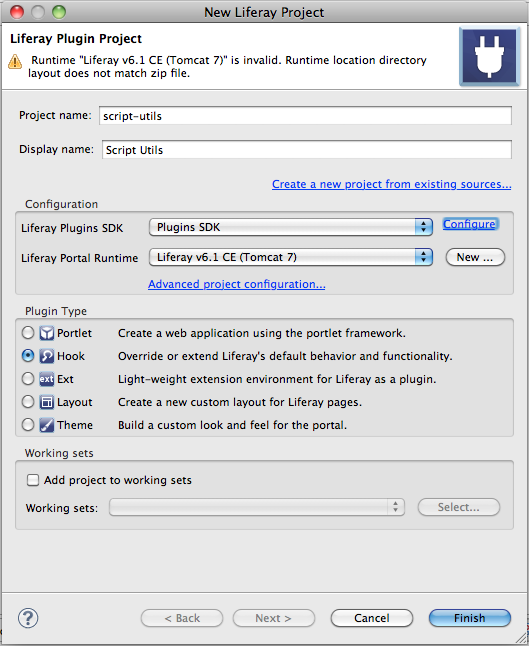 Figure 18.1: Creating a new utilities project is easy if you use Liferay IDE or Liferay Developer Studio. You’re using a Liferay Hook Plugin to deploy your utility, but you’re not using any of the typical hook features. You just need a way to make your code available to the portal and the Hook Plugin is the least obtrusive way to do this. This means you don’t need to add anything to the liferay-hook.xml file. Instead, you’ll begin by adding your utility code. You’ll be following the Dependency Injection design pattern so begin by creating the interface. Right click on the docroot/WEB-INF/src folder and select New → Interface. You’ll create your interface in the com.liferay.sample package. Name it ScriptUtil. Figure 18.2: Create a new Java Interface which you’ll later implement. Next, add two methods to the interface. Next, create the implementation class. Right click on the docroot/WEB-INF/src folder and select New → Class. 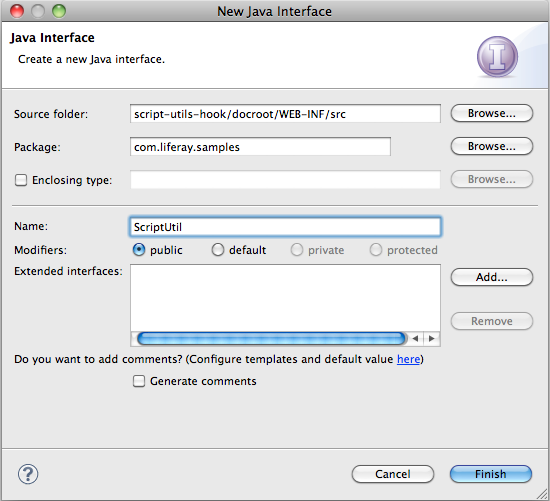 Create the interface in the com.liferay.sample package and name it ScriptUtilImpl. Be sure to select com.liferay.sample.ScripUtil as the Interface. 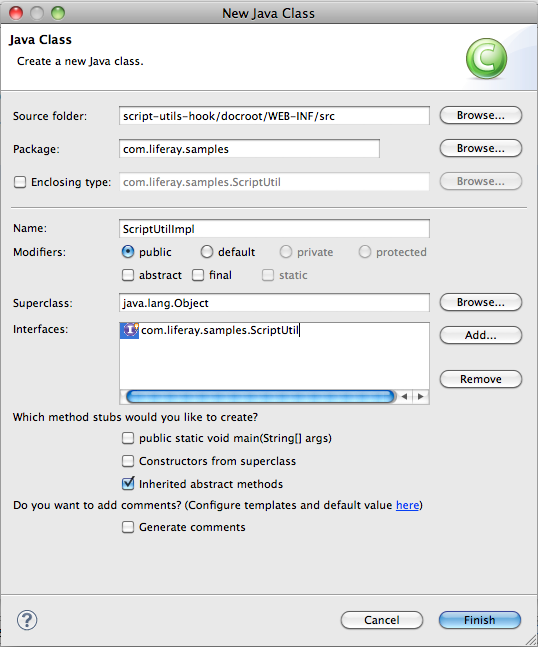 Figure 18.3: Create a new Java Class that implements the interface you created earlier. Next, add implementations for the two methods. Upon deployment, you’ll need the portal to create a BeanLocator for your plugin. The BeanLocator reads the bean definitions you provided. Save all of the changes you’ve made and deploy the hook. Once the hook has been deployed successfully, the ScriptUtil can be used in your script engine code. You should see the results of your script displayed right under the script.